Thursday night in Boston, I went for a walk with a gay orthodox Jewish convert also thinking about going to rabbinical school. Afterward he showed me his iPad, we got kosher Chinese with his husband, and continued on resolving the problems of modern Judaism. Jose believes that "Halakcha is binding." That is to say, in some sense, Jews must follow the laws set forth by the Torah and rabbinic interpretation. He doesn't know exactly what "binding" or "must" mean, and he acknowledges that, but he's committed to finding out. Jose believes that Leviticus 18:22, usually translated something like "Thou shalt not lie with mankind, as with womankind: it is abomination," doesn't forbid homosexuality as most interpreters think, and neither does any other biblical passage. He doesn't know yet what that line does mean, but it cannot be what it looks like. Jose is also thinking about going to Hebrew College, the school I was in Boston to visit. If ordained, he would be one of very few rabbis to publicly identify as both orthodox and gay. He sees novelty in that, but no contradiction. Listening to this man talk, I was really impressed with the depth of his knowledge and conviction. By comparison, my own musings about Judaism felt vague and insubstantial, but he was very indulgent. "Um. I feel like it's about the Spirituality, you know? And the other stuff is kinda different from that. Right?" At stake for me is making Judaism work in the context my fancy contemporary commitments to humanism and universalism, and I don't think Jose feels like he struggles with that. His primary context is Judaism, he just hasn't found all the proof-texts yet for things he knows to be true. What strikes me now about the conversation is that we're both committed to changing Jewish practice and discourse in a manner authentic to its history. Changing Judaism in order to keep it the same (whereas actually keeping it the same, as people tried to do this century, was a major break from history). I know, and Jose knows, that it's a critical task. Hebrew College can't show either of us what that actually looks like, but it can equip us to participate in the process. In time, we'll work out the rest for ourselves. Or maybe not for ourselves, so much as together. Another night in another part of Boston, walking home from another conversation, buzzed on Truth, I knew with certainty that everyone has their own special purpose, a highest calling, a greatest use. That we are happiest and best for the world when we live by that star, as hard as it can be to do so. That some part of my star is in the rabbinate, and that some part of the job of a rabbi is to help people live by their own stars, working together in holy constellation. By the morning, of course, I no longer knew these things with such certainty, but I was still buzzed. I'm a terrible dancer. I like dancing. A lot, even. But I look kinda funny, and I get by more on weirdness and enthusiasm than talent. At my best I'm just feeling the music and moving my body, and I don't really care what that looks like. That's all well and good when I'm dancing on an empty street, or in the solitude of a large crowd, but if I ever try to dance with someone (or, Heaven forbid, some poor damned soul tries to dance with me) my strategy doesn't work out so well. There's a lot of communication involved in dancing with a person. I wiggle my arm like so, and then you wiggle your arm like so, and then here we are, wiggling our arms together. Isn't that lovely! But not so much, really. 'Cause if you wiggle your arm, and then I try wiggling my arm, I feel like I'm copying you, like I'm cheating on a test or stalking you or something, and I get really uncomfortable. And if I wiggle my arm, and then you start wiggling your arm, I feel like I have this huge responsibility now, to move in a way that's predictable enough for you to show any semblance of following along. I can't handle that pressure, man. Just feeling my body and the music is complicated enough. What am I supposed to do with you? I saw Rada (the same friend I met in Savannah) just about a week after my birthday, and I still was fully obsessed with that song I had listened to. As she and I walked down the street one day, I popped one bud of my iPod into each of our heads and played it for her. Our iMbilical cord made us keep our heads together, walking pretty close. I swung an arm around Rada's shoulders and squoze her tight, our hips already making a playful figure-8 together as we walke. This was just a hair shy of dancing already. With a little musical encouragement, we crossed the hair. Lo and behold, Rada and I were dancing together. 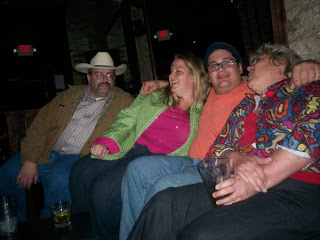 I met a woman in Austin, Texas, who tried to teach me how to Two-Step. She was forty-five or fifty or so, out on the town with her daughter and son-in-law. She had that new-divorcee smell, and she just seemed to want to take her mind off things. She told me that the most important thing to know about Two-Step is that however I'm doing it is right. My job is to move us both around the dance floor; her job is to make it look graceful. I tried my darndest, and I got a little better after a couple of drinks, but it never felt natural. I never felt comfortable moving her around. With my good friend Rada, just walking down the street, guiding someone else's movement felt a little more natural. Feeling my body and feeling the music (and not looking at her - that probably made it less mental) meant also feeling her body. And moving my body, really no matter what, had some consequence for the motion of her body. So you can see where this is going. Somewhere in there, naturally, comes about a gentle suggestion, maybe in my arm, maybe in my hip, that when I go here, you should go there. When I step out here, you can step along with me, and then I do this, and you do that. And then Wow! And That was awesome! The fun of dancing with someone, I think, is in the subtlety and massive parallelism of communication. My sense of self gets to extend into your body, and vice versa, and it's made possible by a dozen different levels of exchange all at once. 'Cause bodies don't dance - people do. Coordinating bodies and minds and fun, we are connecting as people. Wahoo! When I actually visited Hebrew College, what really stood out to me was the caliber of students. I met a lot of 'em there, of all classes and ages, and I really liked the whole bunch. There's a foundation of trust throughout the community. When some people are ready to start something, and some people aren't, they don't say "Hey everybody, shut the hell up!" They hum a song together to start building space. After students lead a class or activity, they open the floor to the rest of the people there, asking, peers to peers, how the activity could have gone better, or just differently. The question was asked and answered each time with a lot of respect. In delicate conversations about Israeli politics or relative strictness of ritual observance, it went without saying that convincing each other was less important than exploring the question. The students there learn as much about practical rabbiing from one another as they do from the professors, and I think that's a pretty awesome way to go about it. After my first day visiting the campus, seeing this student community in action, I had a weird kind of angst about me all over the subway ride home. At some point on a bridge across the Charles I stopped and stared out at some sailboats, and tried to figure out why I might be feeling so crummy. They all just seemed so happy and well-adjusted and talented there. It didn't seem like I would belong. Lying in bed that night, the problem came around differently, and a little bit better maybe. It wasn't really about if I was cool enough (or happy or talented). It's whether I was brave enough to participate. Here was an organization, community, whatever, whose sole use for me was to make me the best Rabbi Yotam Schachter-Shalomi I can be. With no prescription for my particular practice, or theology, or Jewish politics, they just want me to follow my rabbinical star, with me the only judge for what that looks like. They would trust me to decide for myself what I'm gonna be like as a rabbi. They have all the resources necessary to get me there, and they believe in the worth of my rabbinate, even though nobody knows that looks like. It's scary, and it's a lot to live up to. Meeting someone else's standards can take a lot less vulnerability than meeting your own. Now, it's easy enough to turn away from that when it hasn't been laid out for you so explicitly. Cowardice like mine is easy in the dark. But when I faced the question, there was only one answer, right? Do I believe in my own rabbinate? I started crying a little, and grinning a lot. (I cry in like every post, don't I? I cried yesterday, too. I mean, Yadventures? More like CRYadventures! What a Baby.) I thought about the excellent educational possibilities ahead of me, at HC or elsewhere. I thought about my good friends in the Boston Metropolitan Area and the rest of the world. I thought about my rapidly decreasing body mass, and my warm and intimate prayer-life, and the exciting adventures ahead of me. There wasn't anything else left to ask for, really. I've been given everything I need and more, and God was leaning in to ask me if I will be willing, when the time comes, to use it all in Service. Again, when you're faced with a question like that, there is only one answer. I said Yes, excited, delighted, honored, and went to sleep. Well, I tried to go to sleep. It usually takes me a while, and I was kinda all worked up. But I really enjoyed lying in bed and feeling my heart grow for a while, and then eventually I wasn't awake anymore. You know how that is.